Is Toyota Motor Corporation (NYSE:TM) A Good Stock To Buy? Is Toyota Motor Corporation (NYSE:TM) a good stock to buy right now? We at Insider Monkey like to examine what billionaires and hedge funds think of a company before doing days of research on it. Given their 2 and 20 payment structure, hedge funds have more incentives and resources than the average investor. The funds have access to expert networks and get tips from industry insiders. They also have numerous Ivy League graduates and MBAs. Like everyone else, hedge funds perform miserably at times, but their consensus picks have historically outperformed the market after risk adjustments. Is Toyota Motor Corporation (NYSE:TM) the right investment to pursue these days? Hedge funds are turning less bullish. The number of bullish hedge fund positions fell by 1 lately. 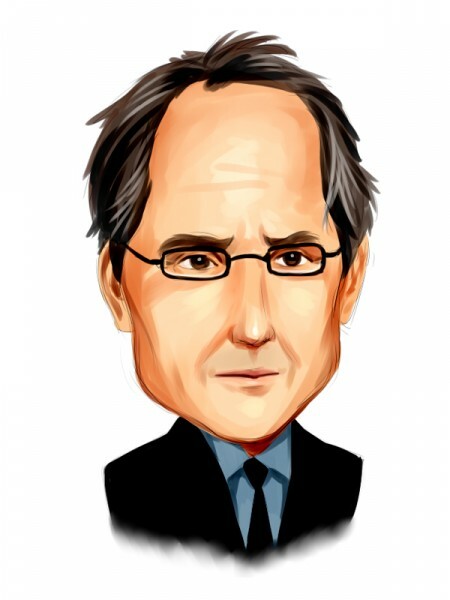 Our calculations also showed that TM isn’t among the 30 most popular stocks among hedge funds. We’re going to go over the latest hedge fund action encompassing Toyota Motor Corporation (NYSE:TM). What does the smart money think about Toyota Motor Corporation (NYSE:TM)? Heading into the first quarter of 2019, a total of 8 of the hedge funds tracked by Insider Monkey held long positions in this stock, a change of -11% from the previous quarter. 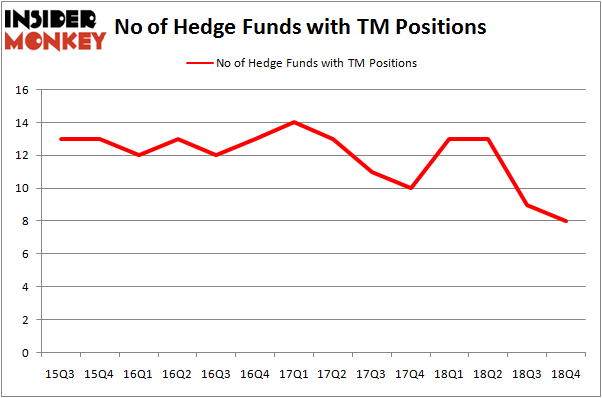 On the other hand, there were a total of 13 hedge funds with a bullish position in TM a year ago. So, let’s check out which hedge funds were among the top holders of the stock and which hedge funds were making big moves. The largest stake in Toyota Motor Corporation (NYSE:TM) was held by Renaissance Technologies, which reported holding $89.5 million worth of stock at the end of September. It was followed by Adage Capital Management with a $28.9 million position. Other investors bullish on the company included PEAK6 Capital Management, D E Shaw, and Citadel Investment Group. Judging by the fact that Toyota Motor Corporation (NYSE:TM) has experienced a decline in interest from the smart money, logic holds that there lies a certain “tier” of funds that decided to sell off their positions entirely heading into Q3. Interestingly, Ken Griffin’s Citadel Investment Group dropped the biggest stake of all the hedgies followed by Insider Monkey, totaling close to $2.2 million in stock. Ken Fisher’s fund, Fisher Asset Management, also dumped its stock, about $0.2 million worth. These moves are intriguing to say the least, as total hedge fund interest was cut by 1 funds heading into Q3. Let’s check out hedge fund activity in other stocks similar to Toyota Motor Corporation (NYSE:TM). These stocks are HSBC Holdings plc (NYSE:HSBC), The Walt Disney Company (NYSE:DIS), Oracle Corporation (NYSE:ORCL), and PepsiCo, Inc. (NASDAQ:PEP). This group of stocks’ market caps resemble TM’s market cap. As you can see these stocks had an average of 47.25 hedge funds with bullish positions and the average amount invested in these stocks was $3556 million. That figure was $133 million in TM’s case. The Walt Disney Company (NYSE:DIS) is the most popular stock in this table. On the other hand HSBC Holdings plc (NYSE:HSBC) is the least popular one with only 11 bullish hedge fund positions. Compared to these stocks Toyota Motor Corporation (NYSE:TM) is even less popular than HSBC. Our calculations showed that top 15 most popular stocks among hedge funds returned 19.7% through March 15th and outperformed the S&P 500 ETF (SPY) by 6.6 percentage points. Unfortunately TM wasn’t in this group. The small group of hedge funds that bet on TM were disappointed as the stock returned 2.5% and underperformed the market. If you are interested in investing in large cap stocks, you should check out the top 15 hedge fund stocks as 13 of these outperformed the market. Do Hedge Funds Love Taiwan Semiconductor Mfg. Co. Ltd. (TSM)? Here is What Hedge Funds Think About Cisco Systems, Inc. (CSCO) Were Hedge Funds Right About Merck & Co., Inc. (MRK)? Should You Buy The Boeing Company (BA)? Were Hedge Funds Right About The Coca-Cola Company (KO)? Were Hedge Funds Right About Novartis AG (NVS)?